Day 13 was a pure check the box on the Green Beast that Sweet Hubs uses for his commute. At the end of a long day of cooking, yoga, and home chores I just rolled his bike back and forth and called it good. Day 14 turned into what you might call a more “interesting” day when we went out to the garage to use the car for a bunch of errands involving long miles and heavy stuff, only to find that the battery had gone dead for reasons unknown. Why is it that you always and only realize that you should have cleaned the garage at some point in the past when the day arrives in the present that you need to find something in it? As much searching as we could do, given that the dead car sat in the middle of the narrow space, revealed that we no longer owned any kind of battery charger or jump-starting device despite our firm belief that at one point in our lives we had owned such a thing. The original plan: Get breakfast or brunch and then run the errands. Noon came and went while we searched. Someone’s stomach growled loudly. The solution, of course: Use our bikes. New plan: Since we ride fueled by calories, first bike to get food, then to find a charger and go home to get the car running. 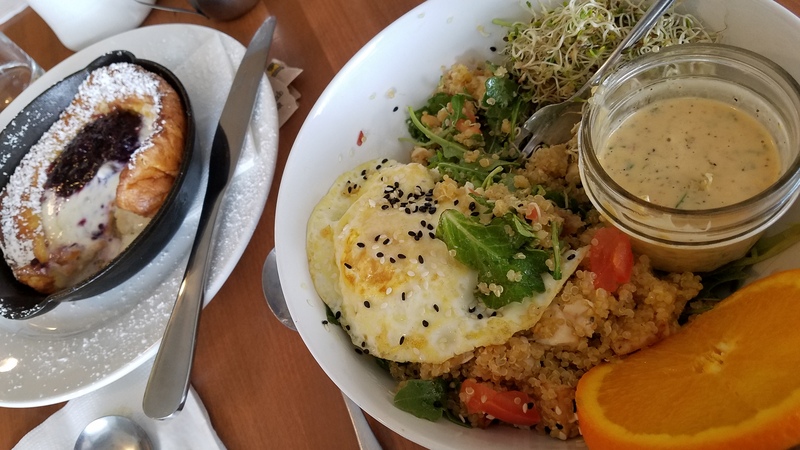 At our brunch destination an easy two-mile ride away we tanked up on deliciousness at Salmon Creek Cafe. Thanks so much, WaBiBurien, for making sure bike rack parking can be found all over town! The quoina bowl with a zippy, citrusy dressing. Some of this had to go home with me so I had room for my half of that delicious Dutch baby right above. From there it was less than a mile to McLendon’s Hardware, where I looked at plants outside and kept an eye on the bicycles while Hubs shopped.They didn’t have a charger, so we rode another half-mile or so to the auto parts store to get the charger. No bike racks at McLendon’s so we did the usual bike parking improv. Expected but funny — no bike rack at the auto parts store, but plenty of parking for the car we didn’t have with us since it wouldn’t start. Then back home, where we discovered that the ingenious rig-up Sweet Hubs had put together with the computer power supply had in fact put at least some charge into the battery, but it was nine years old and we didn’t count on it to hold the charge. The car did start so we could get to the auto parts store and buy the new battery. From there we ran those bigger errands involving a bunch of plants and a bunch of groceries and got back home, happy to get out of the chilly wind that had picked up and even happier that we own bicycles and live close to essential services — like brunch. Sweetie gives a big thumbs-up to our Bikes Rescue Cars expedition.